Greeks liked to create proportioned and equilibrated buildings. It is an architecture to be seen, not to enter in. Due to this the sculptural values and volumes are taken into account, as if the building was a sculpture. For the Greek artist beauty is proportion and measure, just the opposite to the architecture of some other old empires that developed a colossal architecture. Greek architecture has a human dimension, to honour their Gods, and it is just anti-colossal. The way in which the polis were organised did not ease the development of a palace architecture but it paved the way for other buildings, both civilian and religious: theatres, sanctuaries, gymnasiums in which they combined the ideal of beauty with practical solutions according to city life. The basic Greek building and the materialization of the aesthetic ideals is the temple, which is conceit as God’s residence, not as a place for praying. Due to this the inside lacks of importance while the exterior is carefully worked. Urbanism had an important development. In Mileto the architect Hipodamo put into practice, for the first time, his orthogonal plan, with straight and uniform rooms, that would be the basis of modern urbanism in our times. Greek architecture is lintelled (this is, they use straight line in the superior part of doors and windows and in the covers). Horizontal and vertical lines, combined, offer the impression of serenity and equilibrium they aimed at achieving. The column is the characteristic element, and its treatment defines the three architectonical orders (Doric, Ionic and Corinthian). The concept of order is the relation between the different parts of the building. Doric is the simplest style, with his column without basis, the shaft with lines ending in sharp edges and a simple capital, just with some mouldings. The tablature is divided in metopes and triglyphs. Ionic order is a bit higher and more stylised, with basis, column in which the shaft has lines but ending in blunt edges and the capital with volutes. The tablature is not divided vertically, but horizontally, with three bands. Corinthian is the most decorated. It is similar to the Ionic in the basis and the shaft but the capital is a kind of basket with acanthus leaves and small volutes. The tablature is similar to the Ionic. The constructive materials were stone (limestone) and, during the classical period, white marble from the Penteliko. The stones of the walls are isodomus, this is, perfectly cut and ordered, without any kind of mortar. The buildings were polychrome. Looking for visual harmony, Greek recoursed to several technical resources to correct the optical deformations a building produces when been seeing from the distance. Some of the measures taken were: the tablature and the estilobatus (last stair) are curved to the top in the middle; columns are curved to the middle, to eliminate the impression of fall, the entasis is the enlargement of the column in the middle, to avoid the impression of concavity. Columns in the sides are bigger than the rest so that from the distance all appear to be equal. The distance between columns is different too. All these imperfections made possible to see the building as perfect from the outside. Its origins are in the pre-Hellenic megaron, which was built in wood. The structure is of a rectangular plan, with longitudinal axis. 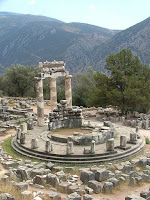 There are also temples with circular plan and centralised axis that are known as tholos. The internal division consists of three rooms: the first one or porch, open to the outside is the pronao, the second one or main room is the nao or cella, where the chapel of the God and its gigantic sculpture were; the last room is the opistodomo, and its function was to keep the treasure of the temple. Temples are located in isolated areas with holy character. The cult was celebrated in the outside, in front of the main temple. It was built on top a series of stairs or crepis to make it easier to be seen and separate from the humidity of the floor. The façade is the main part in which the orders are developed. The classification is made taking into account the disposition and number of columns. Depending on the disposition, temples can be: antae when they have pillars in the lateral walls; when the building has columns in one of the façades is called prostyle, when the columns appear in frontal and back façades it is called amphiprostyle and when the building is surrounded by columns it is known as peristyle . When instead of a line of columns around this is double we are in front of a dipter temple. Finally, the circular temple is monpter because it has one line of columns. 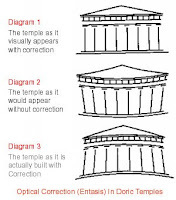 The second classification depends on the number of columns in the main façade and the temple can be tetrastile with four columns, hexastile with six and octastile with eight. 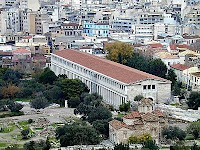 In some areas, as in the case of Athens, the religious buildings are concentrated in a holy place that is known as the Acropolis. The plays had a chorus of up to fifty people, for whom the orchestra or first line of sites was. The centre was called skene and it was a circular space. The theatres were originally built on a very large scale to accommodate the large number of people on stage, as well as the large number of people in the audience, up to fourteen thousand. Mathematics played a large role in the construction of these theatres, as their designers had to able to create acoustics in them such that the actors' voices could be heard throughout the theatre, including the very top row of seats. Other element was the paraskenia or wall behind the scene and behind it was the proskenion that separated the audience from the stage. In this area there were rooms for material and other elements of the theatre. · The palestra or a gymnasium, the social centre for male citizens. These peripterally enclosed space open to the sky were used for athletic contests and exercise. 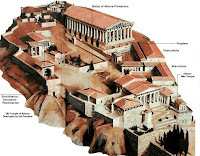 · Greek towns also needed at least one bouleterion or council chamber, a large public building which served as a court house and as a meeting place for the town council.